356 pages | 31 B/W Illus. Sport is a global business. Now more than ever, sport communication professionals need to understand sport’s global reach in order to develop their full potential. 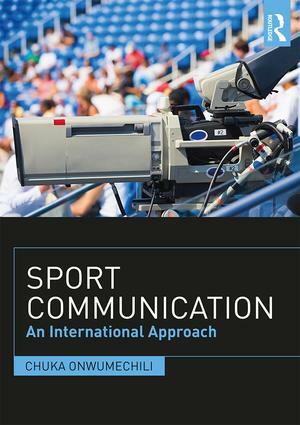 This is the first textbook to introduce the fundamental principles and practice of sport communication from an international perspective. Combining business strategies with insights into social issues such as gender, disability and national identity, this is an accessible, practical and engaging guide to the essentials of sport communication. Aimed to enhance learning at both undergraduate and postgraduate levels, each chapter contains special features tailored to meet the needs of students and instructors. These include learning objectives, chapter summaries, activities, reflections, discussion questions, recommended resource lists and original cross-cultural case studies that demonstrate sport communication theories put into practice. Its twenty chapters explore communication in sport across all levels, from interpersonal communication and team building to strategic communications, and in all forms of media, from print and broadcast to social media. Sport Communication: An International Approach is an essential text for any course on sport communication, sport business or sport management. Chuka Onwumechili is Professor of Strategic, Legal and Management Communication at Howard University in Washington D.C., USA. Alongside his role as Department Chair, he is Editor-In-Chief of The Howard Journal of Communications, a position he assumed in September 2014. He has authored, co-authored, and co-edited ten books, including most recently Identity and Nation in African Football: Fans, Community and Clubs. He has also published in several peer-reviewed academic journals. His research interests currently focus on football and communication, particularly as it intersects with the African continent.